Caesarea Philippi -Ancient Greek: Καισαρεία Φιλίππεια or Caesarea Paneas (Καισαρεία Πανειάς); even called "Neronias"- was an ancient Roman city located at the southwestern base of Mount Hermon. It was adjacent to a spring, grotto and related shrines dedicated to the Greek god Pan, and called "Banias, Paneas", or Baniyas (not to be confused with Baniyas in northwestern Syria). The surrounding region was known as the "Panion". The city is mentioned in the Gospels of Matthew and Mark. The city is now nearly uninhabited: it is an archaeological site in the Golan Heights called Banias. Banias does not appear in the Old Testament. 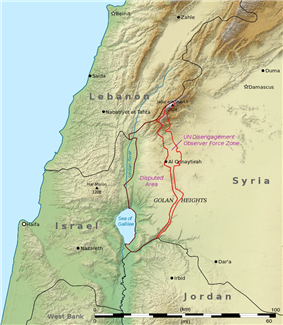 Theodoret, Benjamin of Tudela, and Samuel ben Samson all incorrectly identified it with Laish (Tel Dan), while Eusebius of Caesarea accurately places Dan/Laish in the vicinity of Paneas at the fourth mile on the route to Tyre. Ruins of the Agrippa palace in "Neronias/Caesarea Philippi"
Alexander the Great's conquests started a process of Hellenisation in Egypt and Syria that continued for 1,000 years. Paneas was first settled in the Hellenistic period. The Ptolemaic kings, in the 3rd century BC, built a cult centre. Panias is a spring, also known as Banias, named for Pan, the Greek god of desolate places. It lies close to the fabled "way of the sea" mentioned by Isaiah, along which many armies of Antiquity marched. In the distant past a giant spring gushed from a cave in the limestone bedrock, tumbling down the valley to flow into the Huela marshes. Currently it is the source of the stream Nahal Senir. The Jordan River previously rose from the malaria-infested Huela marshes, but it now rises from this spring and two others at the base of Mount Hermon. The flow of the spring has decreased greatly in modern times. The water no longer gushes from the cave, but only seeps from the bedrock below it. Paneas was certainly an ancient place of great sanctity and, when Hellenised religious influences were overlaid on the region, the cult of its local numen gave place to the worship of Pan, to whom the cave was dedicated and from which the copious spring rose, feeding the Huela marshes and ultimately supplying the river Jordan. 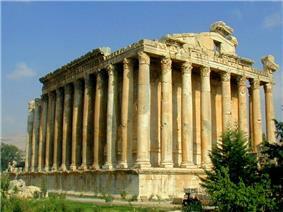 The pre-Hellenic deities that have been associated with the site are Ba'al-gad or Ba'al-hermon. The Battle of Panium is mentioned in extant sections of Greek historian Polybius' history of "The Rise of the Roman Empire". The battle of Panium occurred in 198 BC between the Macedonian armies of Ptolemaic Egypt and the Seleucid Greeks of Coele-Syria, led by Antiochus III. Antiochus's victory cemented Selucid control over Phoenicia, Galilee, Samaria, and Judea until the Maccabean revolt. The Hellenised Sellucids built a pagan temple dedicated to Pan (a goat-footed god of victory in battle [creator of panic in the enemy], desolate places, music and goat herds) at Paneas. 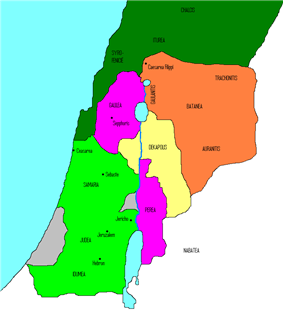 During the Roman period the city was administered as part of Phoenicia Prima and Syria Palaestina, and finally as capital of Gaulanitis (Golan) was included together with Peraea in Palaestina Secunda, after 218 AD. The ancient kingdom Bashan was incorporated into the province of Batanea. On the death of Zenodorus in 20 BC, the Panion, which included Paneas, was annexed to the Kingdom of Herod the Great. He erected here a temple of "white marble" in honour of his patron. In the year 3 BC, Philip II (also known as Philip the Tetrarch) founded a city at Paneas. It became the administrative capital of Philip's large tetrarchy of Batanaea which encompassed the Golan and the Hauran. Flavius Josephus refers to the city as Caesarea Paneas in Antiquities of the Jews; the New Testament as Caesarea Philippi (to distinguish it from Caesarea Maritima on the Mediterranean coast). In 14 AD, Philip II named it Caesarea (in honour of Roman Emperor Caesar Augustus) and "made improvements" to the city. His image was placed on a coin issued in 29/30 AD (to commemorate the founding of the city), this was considered as idolatrous by Jews but was following in the Idumean tradition of Zenodorus. On the death of Philip II in 33 AD, the tetrachy was incorporated into the province of Syria with the city given the autonomy to administer its own revenues. During the First Jewish–Roman War, Vespasian rested his troops at Caesarea Philippi in July 67 AD, holding games over a period of 20 days before advancing on Tiberias to crush the Jewish resistance in Galilee. In the Synoptic Gospels, Jesus is said to have approached the area near the city, but without entering the city itself. Jesus, while in this area, asked his closest disciples who they thought he was. Accounts of their answers, including the Confession of Peter, are found in the Synoptic Gospels of Matthew, Mark, and Luke. Here Saint Peter made his confession of Jesus as the Messiah and the "Son of the living God", and Christ in turn gave a charge to Peter. According to the Christian ecclesiastical tradition, a woman from Paneas, who had been bleeding for 12 years, was miraculously cured by Jesus. Caesarea Philippi became the seat of a bishop at an early date: local tradition has it that the first bishop was the Erastus mentioned in Saint Paul's Letter to the Romans (Romans 16:23). What is historically verifiable is that the see's bishop Philocalus was at the First Council of Nicaea (325 AD), that Martyrius was burned to death under Julian the Apostate, that Baratus was at the First Council of Constantinople in 381, and Olympius at the Council of Chalcedon in 451 AD. In addition there is mention of a Bishop Anastasius of the same see, who became Patriarch of Jerusalem in the 7th century. In the time of the Crusades, Caesarea Philippi became a Latin Church diocese and the names of two of its bishops, Adam and John, are known. 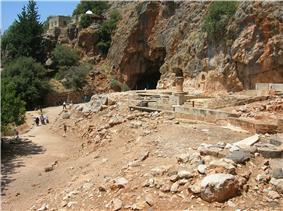 No longer a residential bishopric, Caesarea Philippi is today listed by the Catholic Church as a titular see. It is also one of the sees to which the Greek Orthodox Church of Antioch has appointed a titular bishop. In 635 AD, Paneas gained favourable terms of surrender from the Muslim army of Khalid ibn al-Walid, after the defeat of Heraclius’s army. In 636 AD, a newly formed Byzantine army advanced on Palestine, using Paneas as a staging post, on the way to confront the Muslim army at Yarmuk. The depopulation of Paneas after the Muslim conquest was rapid, as the traditional markets of Paneas disappeared (only 14 of the 173 Byzantine sites in the area show signs of habitation from this period). The Hellenised city fell into decline. At the council of al-Jabiyah the administration of the new territory of the Umar Caliphate was established, Paneas remained the principal city of the district of al-Djawlan (the Golan) in the jund (military Province) of Dimshq (Damascus), due to its strategic military importance on the border with Filistin (Palestine). Around 780 AD, the nun Hugeburc visited Caesarea and reported that the town had a church and a "great many Christians". Today Caesarea Philippi is a site of archeological importance, and lies within the Hermon Stream Nature Reserve. The ruins are extensive and have been thoroughly excavated. 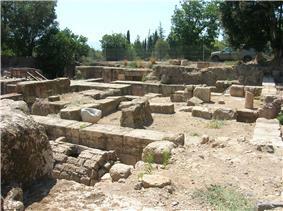 Within the city area the remains of Agrippa's palace, the Cardo, a bath-house and a Byzantine-period synagogue can be seen. ^ Josephus, Flavius war of the Jews Book 3 chapter 10 para 7 As for Panium itself, its natural beauty had been improved by the royal liberality of Agrippa, and adorned at his expenses. ^ Brown, Peter, The World of Late Antiquity, W. W. Norton, New York, 1971, ISBN 0-393-95803-5 p. 93.